This is a community master plan for the neighborhoods of Benton Park West, Gravois Park, northeast Dutchtown and a small part of Mt. Pleasant. Adopted as an amendment to the Comprehensive Plan of the City of St. Louis by the St. Louis Planning Commission in May of 2018, it covers over 300 policy points divided up into sections regarding Safety; Youth and Education; Employment and Business Development; Housing; Health; Transit, Streets, and Walkability; Arts and Culture; and Environment. There are additional sections regarding neighborhood history, other planning efforts, and a study of the primary and secondary markets making up this planning area. 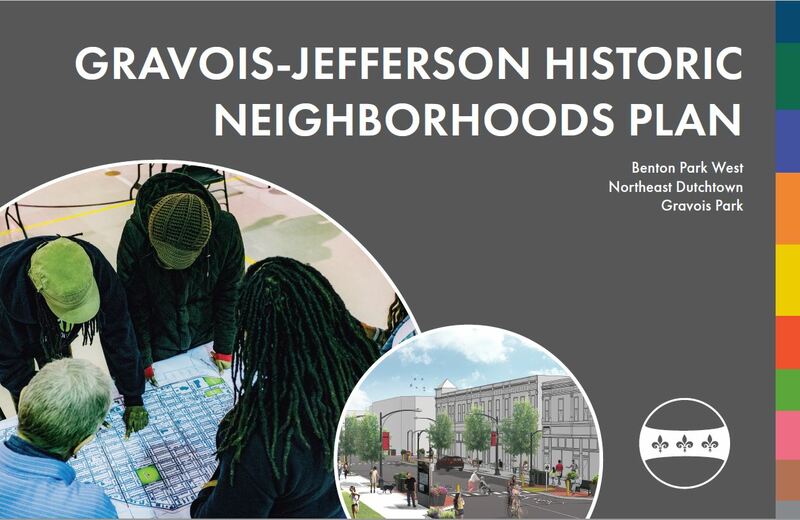 To download other layouts, please view the downloads page on the Gravois Jefferson Planning website by clicking here. All PDF files are zipped; you will need to download and unzip them before viewing.